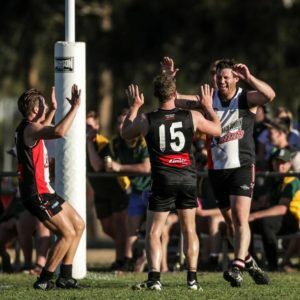 Jindera’s fairytale run in the Hume finals continued on Saturday with a stirring 17-point victory over Henty in the preliminary final at Walbundrie. The Bulldogs who did not win a game in the month of July have strung together three straight wins over Osborne, Holbrook and now Henty. They will now take on Brock Burrum Saints in this Saturdays grand final at Walbundrie with a lot of confidence and belief. It will be the Bulldogs third grand final appearance in a row and they will be desperate to turn around the defeats in the two previous deciders. It will be a repeat of the 2016 decider when the Saints defeated Jindera by 33 points. Last year Osborne beat Jindera by 25 points. The Doggies were given a huge boost prior to Saturdays game when Trent Castles successfully defended a charge at the Hume league tribunal. 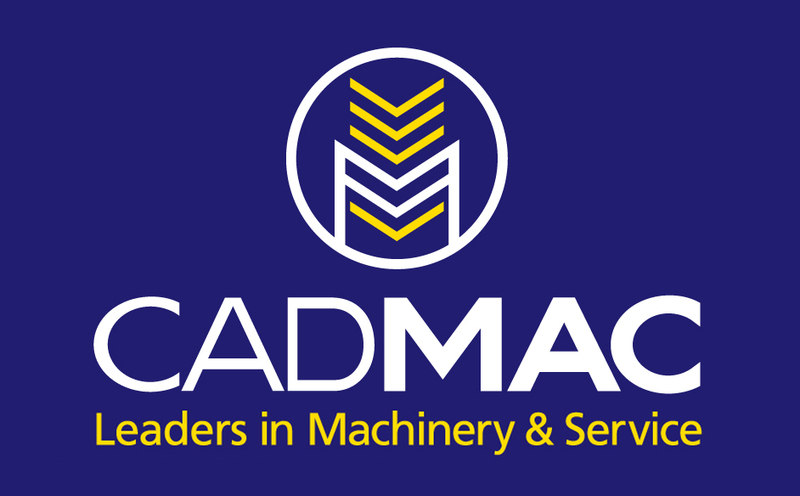 Castles had been offered a two-week penalty (reduced to one week on accepting the penalty) by the video review panel for a clash with Holbrook’s Alec Sullivan. Jindera rolled the dice and got the charged downgraded, and with his good record was given a reprimand and subsequent all clear to play. The star forward certainly had an impact booting a game total of five goals, including four in the first half and a constant threat to the Henty defenders. The match was played in very windy conditions with the breeze blowing to the Lockhart end eastern pocket. Jindera went into the game missing gun midfielder Dylan Pettingill and Connor Clayton who were injured from the previous weeks bruising encounter against Holbrook. In an entertaining first quarter, both teams kicked three goals, with Henty also booting four behinds as inaccuracy was to be a real hindrance throughout the encounter. 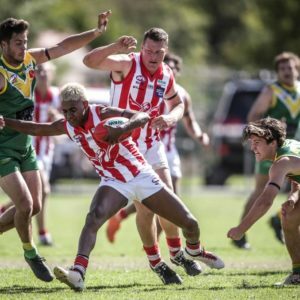 The Bulldogs took some control with four goals to one in the second term as Castles took control of some midfield dominance. The Swampies dominated the third term with the breeze at its back and had taken back the lead midway through the term. Jess Wellington levelled the scores for Jindera, before Henty kicked five behinds to finish the quarter in front but the reality it should have been more. The Swampies had ten scoring shots to the Bulldogs one, but only converted this into three goals as Jindera started the last quarter with the breeze and plenty of run. Sam Terlich goaled for the Swampies to take back the lead after Wellington had regained the lead for Jindera with an early goal to start the final term. Michael D’Arcy replied immediately for Jindera to take the lead. With no further goals for the next twelve minutes the game hung on a knifes edge. A goal to Rhys Preston at the 20-minute mark gave the Dogs a 10-point lead before Castles finished the Swampies season with his 110th goal of the season. Swampies star forward Damian Cupido, who finished with 114 season goals, was well held by versatile Jindera backman Tom Weldon to three goals. Cupido, who averaged six goals a game in the home and away season, was less effective during the finals with six goals from its two games. Ryan Speed did a good job in curbing the influence of Swampies star midfielder Daniel Cox, while Wellington was excellent support for Castles with three goals. Sam Myors continued his finals form with another great game, while Dan Middleton provided drive in the midfield alongside Preston. For Henty Heath Ohlin, Harry Nunn and Chris Willis tried hard, while Josh Gaynor was excellent in his return from injury. After losing just two matches in the home and away season, the Swampies form deserted them in the finals with back-to-back losses. 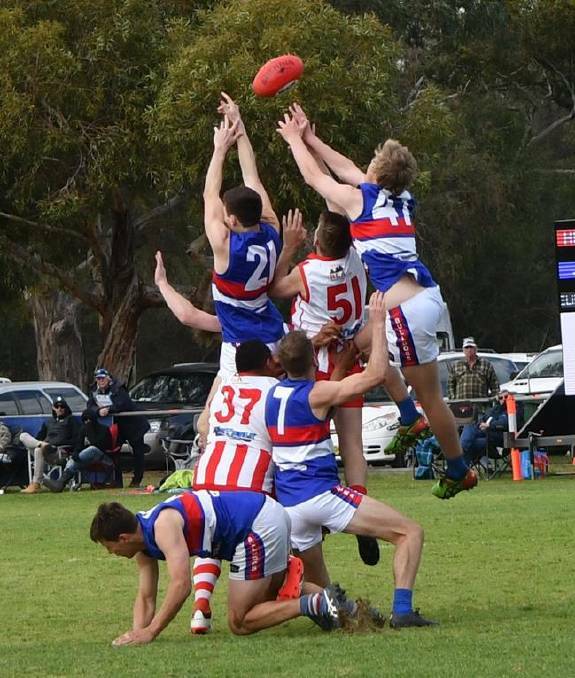 Rand Walbundrie Walla Giants have mirrored what Jindera has done in seniors with its seconds qualifying for the grand final after its third-straight win. The Giants inflicted a 21-point defeat over Brock Burrum to see the Saints exit the finals in straight set losses. Nathan Brown, Brett Davies and Jarrod Weeding starred for the Giants, while Sam O’Connor, Joel Felmingham and Matt Heagney tried hard for the Saints. The Giants will take on the undefeated Jindera in this Saturday’s decider, who will be defending its title it won last year. In the junior grades it will be Holbrook taking on Osborne in the under 17’s, while the Brookers will be against the Giants in the under 14 decider.